SARFT Chairman Cai Fuchao picked an auspicious day, December 15, to announce the latest statistics for China’s cinema business. While two just-opened films featuring Christian Bale (Flowers of War) and Jet Li (Flying Swords of Dragon Gate) battled for moviegoers’ attention and drew huge crowds at the theaters, Cai dropped the news that box office revenue in China this year has already exceeded 12 billion RMB, or US $1.86 billion at 2011’s average exchange rate. Cai also noted that the country’s cinema screen count has crossed the 9,000 mark, a 45 percent increase over the 6,200 screens operating at year end 2010. That 12 billion figure was for the week ending December 11, which means that there are still 3 more weeks in the year for China to extend its record breaking revenue surge. With last night’s screenings of Flowers of War and Flying Swords reportedly running at better than 90 percent of capacity and with ticket prices high—$12.50 for Flowers and nearly $19 for the 3D Flying Swords—these two films alone will likely push China past $2 billion for the year. 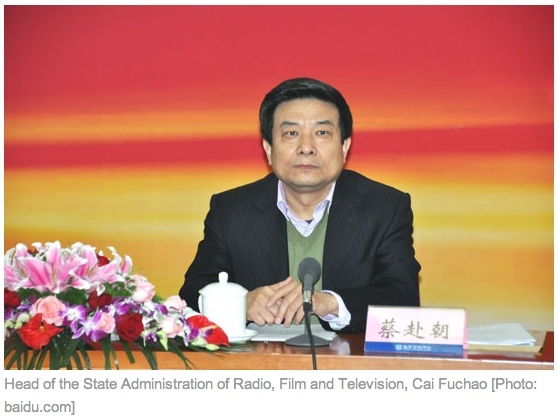 For those of us who closely track China’s film business, Cai’s announcement was like water in the desert, as SARFT only announces these figures a few times a year. Both the box office and screen count numbers were positive surprises for me. It now appears certain that box office growth will hit or exceed the 30 percent rate I had predicted. New screens have been opening at a rate of 8 per day, and the current screen count has surpassed my year-end estimate of 8,900. Total revenue has expanded by a staggering 110 percent in just two years, and is up more than six-fold in the past 5 years. When compared with North America’s sluggish growth of less than 2 percent per year (actually, negative growth on an inflation adjusted basis), it’s mystifying that Hollywood’s major studios haven’t deployed teams of their best people to tackle the opportunities there. Most are largely sitting on the sidelines, tossing a picture or two a year into Chinese theaters, and mainly just watching the China juggernaut pass them by. For 2011, China’s box office growth has once again nearly quadrupled the country’s overall GDP growth rate, at least the 8th year in a row that it has done so. And contrary to those who think the industry is due for a downturn, I believe China’s film business is still in its infancy. It will most likely pass Japan in 2012 to become the world’s biggest territory outside North America; give it 7 or 8 more years and China will pass North America. The reasons for this continuing surge have to do with income growth, improving availability and quality of films, and especially rising screen count. Cinemas will continue to be built because there is a huge shortage of them: China has dozens of cities with populations larger than Boston or Washington that still lack a single multiplex. There exists a fairly predictable straight-line correlation between the number of cinema screens in a country and total box office revenue. If you build it, they will come, so long as you aren’t over-built. 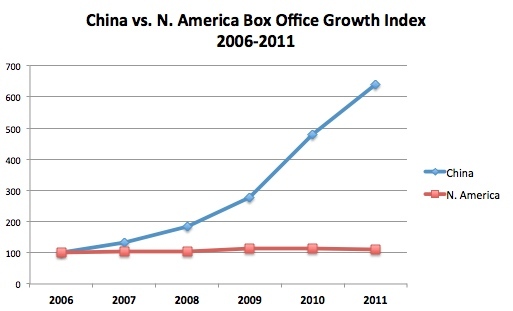 Even with its spectacular 10-year long cinema expansion, China is still the world’s most under-screened major market. Given the country’s projected GDP and per capita income growth, it can build another 50,000 screens and still not be anywhere near over-built. With upside like that, fortunes are just waiting to be made. This entry was posted in Analysis, Box Office Reports and tagged China box office, China film, China's box office, Chinese box office, Flowers of War, Flying Swords of Dragon Gate, Rob Cain, Robert Cain, SARFT by chinafilmbiz. Bookmark the permalink. I’m sitting on the sidelines from Beijing and watching all this unfold. Hopefully, once another 5000 screens are built or before, smaller players from China and foreign co pro producers can get a venue. No room at the Inn currently but I’m waiting for that day which could only be 18 months away on current building rates. That rate may even increase as property developers look further afield for more lucrative than domestic property builds that will have business models already in place like cinemas. I think old china hands like yourself Rob, could lead the way for foreign/expat producers, directors and crew etc. As always, I enjoy the info supplied. Keeps my flame alive.